It used to be the only lunch you’d find in the historical Athens for less than 10 euro per person was a souvlaki to go. Now you can actually sit, be waited on and enjoy a healthy lunch with amazing views. 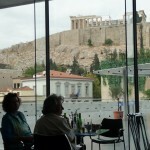 Head to the 2nd level of the New Acropolis Museum, to the museum’s café. Not only will you have the chance to sample some terrific cheeses and fresh seasonal fruits, healthy salads and sandwiches, you’ll enjoy perhaps one of the finest Acropolis views the city has to offer. OK, so they need to work out a few kinks, such as having a bit more organization at the café entrance. As it stands right now (the several times I’ve visited over the past few weeks at least), there’s no real “host” to welcome you in and seat you. Instead, it’s very much “each visitor to himself”, which basically means if you arrive when the café is full, you need to split your group up and scout out tables that have paid their bills and are getting ready to leave. You’ll want to move quickly, since the café is currently very popular with Athenians and they are very fast to grab the first open table. The trick is to make sure you just grab the chair as the previous diner is departing and settle into it quickly, even though the table has not yet been cleaned off. Don’t be polite and wait for the server or busperson to arrive and clean the table before sitting down, by the time it is cleaned off there will be other people seated at it. Don’t worry, you’ll be approached pretty quickly by one of the very friendly servers who will ask you, either in Greek or in very good English, “is this yours”? (referring to the plates, glasses and placemats remaining on the table in front of you). Despite the hassle over getting a table, the service in the Acropolis Museum Café is very good; it’s fast, friendly and your food arrives quite quickly (the menu is small, the food freshly prepared and currently is limited to salads, sandwichs and cheese and fruit plates, as well as desserts. You can have a glass of wine with your meal, a nice touch given the excellent views you’ll be enjoying. If you arrive before 11 AM or after 2:00 PM, getting a table should not be as difficult, and I recommend choosing one up close to the windows if you can. The tables in the center section have the disadvantage of having a bus station taking up about 10 feet of the view, and from these seats you may discover that every photo you take (this seems to be the only area you can take photos) will include at least one or two servers watching their tables …. Note to the museum: there’s lots of space in the “interior” of the café, why not move the bus station and leave the views to your visitors? Note to museum staff, maybe you can move the bus station? The Museum Café is open daily during Acropolis Museum hours (currently 8 AM to 8 PM). I’m pretty certain that you need to pay admission to the museum (just 1 euro through December 31, 2009) in order to get upstairs to the Museum’s café on the 2nd level, although today when we visited we took the elevator to the second level, and although we had purchased tickets to the museum, we did not actually pass through the turn-styles with our tickets. No one ever stopped us and asked for them either, so it may be worth trying this method if you are only there to eat. The elevator is located after the ticket counter, but to the left of the turn-styles. Once you reach the 2nd floor the elevators open just next to the Café entrance. 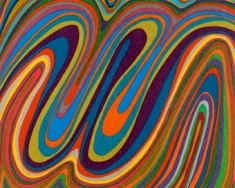 Sol Lewitt, Line & Color – Extended! Amazing to hear that a cafe in a big museum can offer lovely but affordable food. It would never have occurred to me to have a look, thanks for the tip! .-= Robert´s last blog ..Portugal: Cacela Velha revisited =-.